On November 10th, we have a ticketed taste & tour event at the Jacksonville Farmers Market! Just $35, 10 tastes from area chefs, a student culinary competition, market tour, one beverage from Manifest Distillers or Bold City & unlimited daiquiris! Taste what Jacksonville has to offer and support GastroJax at this event! Tickets available at Eventbrite. 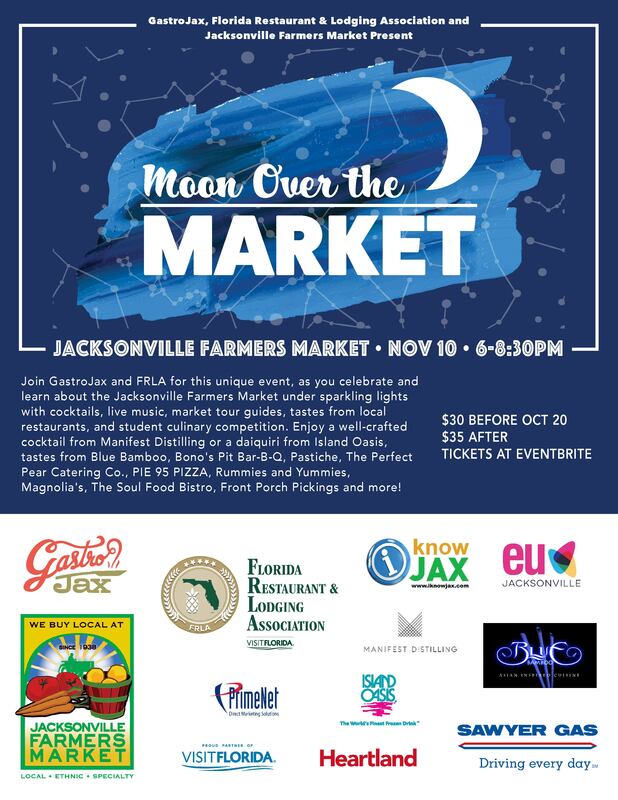 November 10th at 6 p.m. to 8:30 p.m.
GastroJax, Visit Florida, and the Florida Restaurant and Lodging Association present Moon Over the Market on November 10 6 p.m.-8:30 p.m. at the Jacksonville Farmers Market. Held under sparkling lights, our area’s food and drink will shine with live music, adult beverage, local restaurants, and a culinary competition featuring the next generation of chefs. Market guides will be on hand to tell you about the history of the market as you walk through! Tastes from the participants are included in the ticket price, so come hungry! Listen to St. Augustine’s Acoustic Anomaly, enjoy a well-crafted cocktail from Manifest Distilling or a daiquiri from Island Oasis, tastes from Blue Bamboo, Bono’s Pit Bar-B-Q, Pastiche, The Pear, Pie 95 Pizza, Rummies and Yummies, Magnolia’s, The Soul Food Bistro, Front Porch Pickings, and Blue Orchid! Included in your ticket price will be samples from local food providers, an adult beverage, and samples from High School ProStart Culinary Students as they are mentored in a competition using food from the market, with mentorship from local chefs. Just $2 more to vote on your favorite! All general ticket holders can taste, but we ask that you vote on your favorite to benefit the school of your choice. All proceeds from the voting go directly to the schools. Some of the Jacksonville Farmers Market will stay open until 7 p.m. so that you can experience the vendors, both local and exotic, but the party will continue to 8:30 p.m. Media sponsors are EU Jacksonville and iKnowJAX.com. Sponsors include Heartland Payment Systems, Sawyer Gas, Blue Bamboo, Manifest Distilling, Island Oasis, PrimeNet Direct Marketing Solutions, and Visit Florida. Jacksonville Farmers Market is Florida’s oldest public farmers market, opening in 1938. Today, JFM is a rare “working farmers market” with farmers, wholesalers, and retailers all in one place. GastroJax is a 501c3 organization whose mission is to foster and preserve local cuisine, educating the public about local food and beverage sources, local restaurants and North Florida dishes. GastroJax put on GastroFest in 2015 and 2016, drawing 30,000 people each year to Hemming Park. Florida Restaurant & Lodging Association Educational Foundation supports sound educational experiences in preparation for dynamic and rewarding hospitality careers. FRLA is Florida’s premier non-profit hospitality industry trade association. Our mission is to ‘Protect, Educate and Promote’ Florida’s $89.1 billion hospitality industry which represents 23% of Florida’s economy and more than 1.2 million employees – making it the state’s number one industry. We offer regulatory compliance and food safety training needs (RCS and SafeStaff®); industry developed career-building high school programs (FRLAEF); sponsor the only event in Florida exclusively serving the restaurant and foodservice industry (FR&L Show, September 10-12, 2017 in Orlando); and we safeguard the needs of the hospitality industry by providing legislative advocacy. We represent and serve more than 10,000 independent and household name members, suppliers, and theme parks. For more information, go to www.FRLA.org and find us on Twitter @FRLAnews, Facebook and YouTube.